There are 11 reviews of Armani Eau de Nuit Oud. 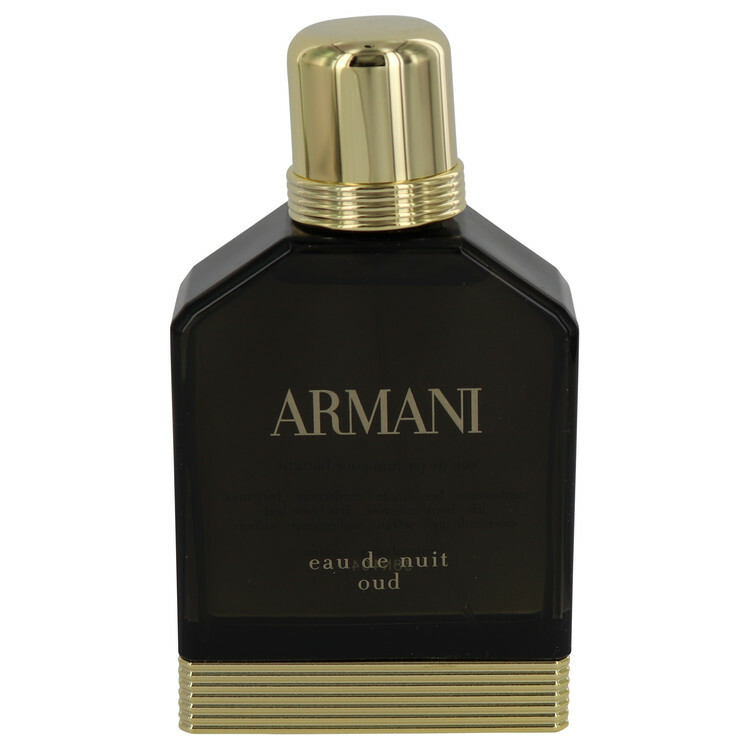 Very likable, well-made oud fragrance from Armani. While I would consider Armani's Prive Oud Royal to be a more superior formulation of an oud scent, Eau de Nuit Oud is quite pleasant and a joy to wear and own. What I've found is that oud is not a monolithic concept in the fragrance world. Different marks explore different facets of what make oud so mysterious and amazing: The floral, spicy, woody, earthy, and smoky sides, inter alia. Eau de Nuit leans towards the oud accented with sweet, peppery notes. Iris and tonka add a slightly floral, roasted quality as well. Eau de Nuit definitely owes homage to its predecessor, Armani Eau de Nuit, which itself shares cardamom, iris, pink pepper, and tonka elements with the Eau de Nuit Oud flanker. I like this interpretaion of the oud mystique by Armani: Classy, long-lasting, smooth, pleasant, and wearable for most occasions. But I'd suggest trying out a sample / decant to make up your mind. An oily floral oud this one. I prefer woody dry ouds and though this is well blended, I do not love it. The rose saffron combo is usually off-putting and too much, but in this instance it is well balanced. It is worth a sniff and I think it would smell better on her than him. Smooth, restrained opening even though its elements have the potential to be potent… but I sprayed lightly. I get primarily pink pepper, cardamom, iris, saffron, and a shadowy oud note; and even though the combination is rather generic and identifiably synthetic, its quiet balance and warmth makes it a plus accord for me. The middle level is a let down from the opening: the spices from the top and base flatten out with the addition a very dusty iris note, so the heart accord turns out to have only powdery, dusty spice-cabinet ambiance. It would help if I could smell the pyramid-listed rose or geranium, but, the only floral that is clear to me is the iris. Even the barely-present oud note doesn’t bring much interest. In the base, along with the exhausted oud, I get a modicum of tonka and saffron... This accord is no more than a pleasant skin scent. Eau de Nuit Oud seems to me to be a genuine Armani product, and that is not necessarily a bad thing… but in this case I was expecting much more than it delivers. It certainly is not an offensive scent, and I do respect its discretion in the beginning, but the scent kept fading both in strength and interest, and its longevity is unacceptable. Well, Giorgio Armani's 'Armani Eau de Nuit Oud' jumps on the Oud bandwagon, so I of course tried this out expecting EDP performance and massive longevity akin to Acqua di Gio Profumo. No, this is a different conversation entirely. The initial blast of this is somewhat offensive and stomach churning. It smells like those mosquito candles you burn to keep bugs from biting you. Seriously. My girlfriend was really upset I sprayed this on and was disgusted by it. I can't smell much of the berganot or cardamom, i mainly got iris and oud notes, alongside geranium and saffron. It smells dirty, earthy and very ethnic. I was really about to shower this off until I decided to try it again the next morning. I gave it a full days wearing a few days later, and after the stomach churning opening, it actually smells quite good. The oud and tonka bean really go well together, and once the iris and rose notes go away, it really is very dark and masculine. With a liberal application of a dozen sprays (neck, shoulders, wrists and chest) is about 8-10+ hours, but with several days up to a week or more on clothing and fabrics. Once it settles in, it really does smell quite sensual and musky, which in the right setting could be wonderful. Definitely for the cold weather months, there is no way this could ever work in any type of season besides the coldest and darkest of winter. But nestled up to a fireplace or out and about in the snowy weather, this scent would be a masterful fragrance. The opening is great but the drydown is lacking. Sweet, woody and fresh but then turns very light and generic. I was sold on this from the opening but after getting past that phase it is not wishlist worthy. Projection is good during the first 3-4 hours and then it goes to a skin scent for another two and then it's gone. There are no member images of Armani Eau de Nuit Oud yet. Why not be the first?